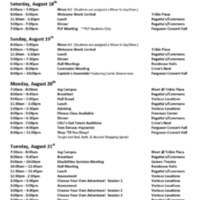 Schedule for Welcome Week 2012. A schedule of the Welcome Week activities planned for students, for 2013. Schedule for students at the 2012 orientation.